Southport Chapel Street station, Lancashire and Yorkshire Railway. 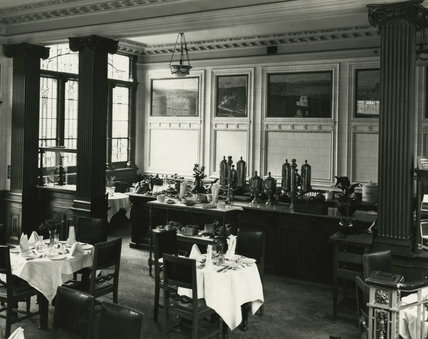 View of the interior of the cafe, showing fully laid tables and the counter. May 1919. Vehicle No. 4911, Composite Twin Brake, with Engine No. 4912. England, 1919. Spoon adapted for use with a mechanical substitute for the arms, United Kingdom, 1919. Mechanical substitute for the arms, United Kingdom, 1919. Craters near the moon's south pole, 1919.